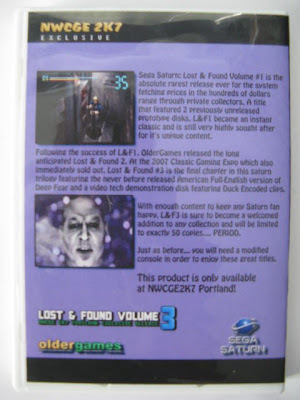 The Lost & Found games are some of the more rare Sega Saturn games and were only released in limited quantities at the CGE Expos in 2006, 2007, and 2008. 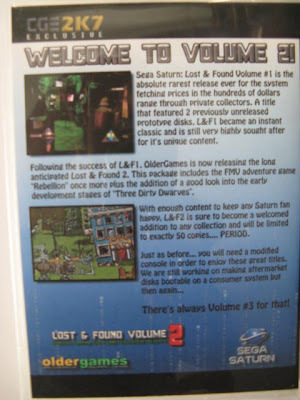 The Lost & Found Series for the Sega Saturn consists of Volumes 1, 2 and 3. 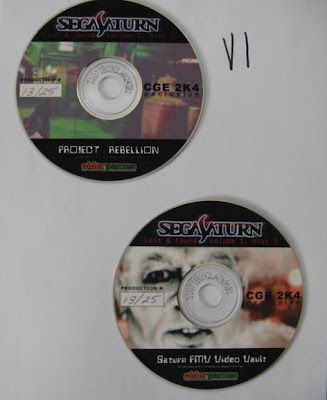 These three volumes, each released separately, consist of a total of seven disks that contain games and video clips that can only be played and viewed on a Sega Saturn modded to play CDR discs. All three Lost and Found versions were made by Oldergames, which no longer makes video games and was sold in 2007 to a company that doesn't seem to be doing anything with the name. 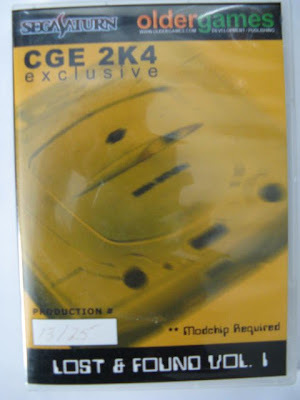 Volume 1, released August 21 2004 at the CGE 2K4 as an exclusive, has a gold-shaded cover. It's the rarest of the three with a limited edition production of only 25 copies. 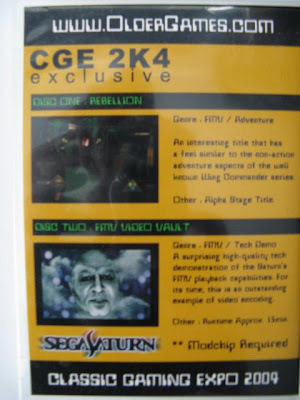 The game contained 2 discs, Project: REBELLION and Saturn FMV Video Vault. Recently, Volume 1 has sold for $350. Volume 2 has a blue shaded cover and was released July 28, 2007 at the NWCGE 2K7. It contains two discs, REBELLION FMV Adventure and THREE DIRTY DWARVES Early Development Prototype. Volume 2 sells for about $75. Volume 3 released September 29 2007 exclusively at CGE 2K7 and has a purple shaded cover. 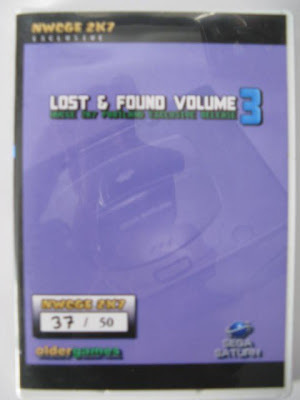 Volume 3 contained three discs, discs one and two are labelled Deep Fear and disc three is labelled Duck Video Tools Sega Saturn Demonstration Disc. Volume 3 sells for about $45. None of the three volumes came with a user manual or any other sort of operating instructions. Each multi-disk volume was packed in a DVD case and each volume had a full cover. 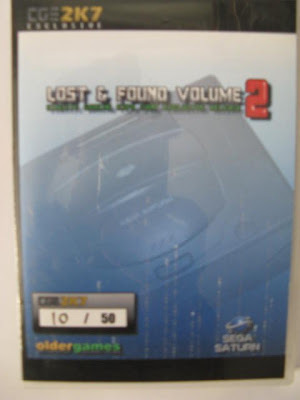 The front covers depicted a photo of the Sega Saturn and the production number of the enclosed set of disks. The back cover of each volume included screenshots of some of the content and some printed information about the included content. Information and photos for this article were provided by Gary P. Doughty. Thank you for the contribution Gary.